Never, under any circumstances, turn your back on your opponent in a critical moment of a game or you'll get absolutely embarrassed and go viral for all the wrong reasons. We understand why Thornwell had his back to Simmons in that situation, so you have to give Simmons a ton of credit for making that heads-up play. 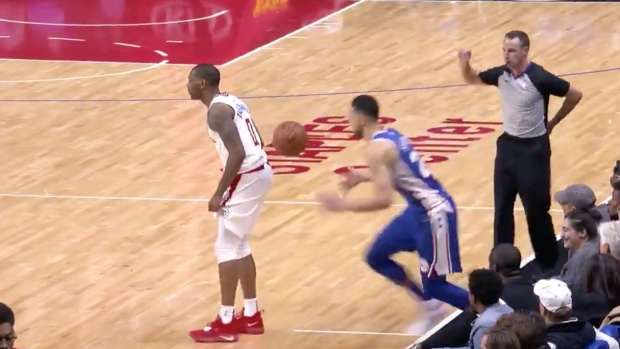 Thornwell was just trying to help deny the inbound and having his back turned to Simmons would allow him to help out a teammate in that situation if someone comes open. Unfortunately for him, Simmons is incredibly crafty and he made him pay. Simmons also attempted a jumper in the win against the Clippers and it didn't go as well as the off-the-back inbound, but it was still a noteworthy play from the game according to the internet.